Not only is it FRIDAY, but... I am very excited to announce PBD's very FIRST Give Away over at Mammalicious Finds! 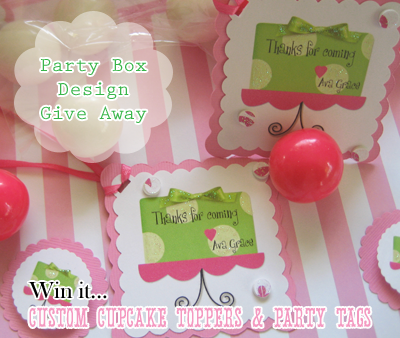 Head over and enter to win you very own custom toppers and tags!!! January is turning out to be a fabulous month for Party Box Design and I am crazy excited to see what the future holds. The V-day cupcake toppers are adorable! I got married in November and registered for a bunch of "cupcake making/decorating tools"- for a shower a friend put together a big Cupcake themed basked for me- it was adorable! ....The V-day cupcake toppers would be a great addition for my next Holiday Cupcakes! Thanks for the PBD love ladies!